Luke Arora won Mid Stakes poker tour Main event for $88,773. Matt Alexander is the one who booked for second position with total winning share of amount $50,264. 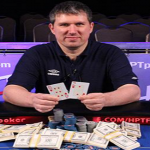 Alexander’s hard luck being repeated one again because after reaching out to his fourth final table of this particular Mid Stakes Poker Tour (MSPT), he got busted to second position only. Luke Arora becomes the new champion of Mid Stakes Poker tour for $88,773. Matt Alexander, The four time finalist remains at second for total $50,264. Nathan Baum of Lincoln got the third prize which was $32,604. It was Mark Sandness who got the fourth place of the event $22,786. Fifth, sixth and seventh places were for Jeff Fielder ($17,090), Jeremy Dresch($13,403) and Tyler Caspers($11,393). Meanwhile #8, #9 and #10 prizes were for Andy Beberg($9,383),Dave Soderstrom($8,042),Steve Vang($6,367). The tournament attracted 347 players and top 36 places of the event were paid. Players at least got some money while participating in such an awesome event were Muneer Ahmaed, who was at 17th placem Adam Dahlin who was at 11th position and Kou Vang, who was at 32nd place of the event. The first elimination was of Steve Vang, who hit the rail to 10th place with total winning share of $6,367 playing against a call of Andy Beberg. The next one to go to the rail was Dave Soderstrom and just after his removal from the final table it was Andy Beberg, got busted to 8th position along with total winning share of amount $9,383. The moment these players were out a couple of more eliminations took place in nature and they were of Jeremy Dresch of Fridley, MN and Jeff Fielder of Des Moines, IA, who got $17,090, as wining share. Heads up was among Luke Arora and a four time finalist as well as MSPT pro Matt Alexander, but Luke Arora got the edge over Alexander by having more chip counts with him and collected the first prize of amount $83,773 and of course the title.